Beautiful Water View Home in Pavilion - Riverview's most sought after community! *Stunning Water View* *New A/C* *Roof 2016* *New Laminate Floors* *Extended Screened Lanai* *Vaulted Ceilings* *Open Concept* *Ultimate Convenient Location* Welcome to 9407 Hidden Water, Your New Home Sweet Home! 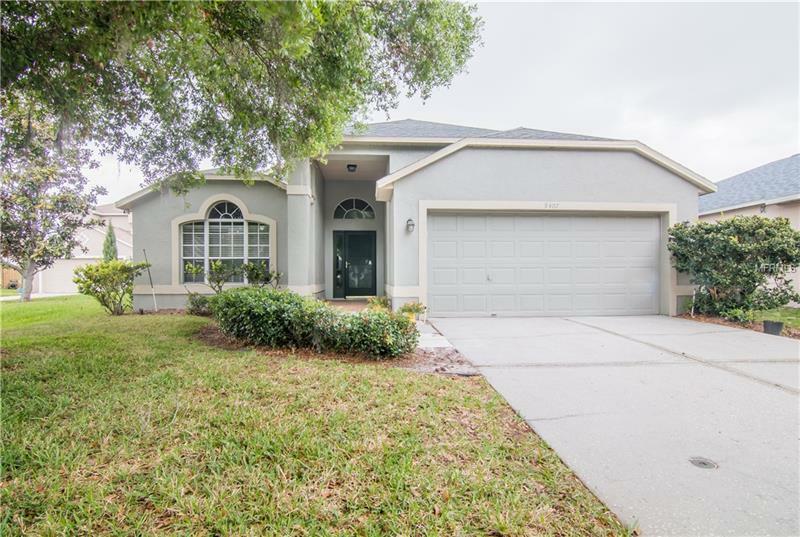 You will fall in Love with the popular Savoy floor plan - Bright and Open Great Room, Formal Dining Room, Kitchen with Breakfast Bar, Stainless Appliances, Tons of Counter Space and a Sunny Eating Area. Master Suite features a Spacious Bedroom with Slider to the Lanai, a Walk-in Closet, and Master Bath with Dual Sinks and a Large Glass Shower. There are 2 generously-sized Secondary Bedrooms and Full Secondary Bath. Inside Laundry Room with plenty of storage space. Step out to the Extended Screened & Pavered Lanai, your new favorite spot to sit and relax or entertain family and friends! Enjoy the Peaceful and Serene Water View from your Large Backyard! The Pavilion Community is loved for its amenities including a Clubhouse with Banquet Room, Fitness Center, a Resort-Style Pool, Park, Playground, Dog Park, Picnic Area and a year long Calendar full of Fun Events! ALL with an Ultra-Convenient Location - fast access to I-75, Selmon Crosstown Expressway and US-301 makes your commutes a breeze! Close to Schools, Shopping, Dining, Entertainment and more! Don't miss out, come see it today!